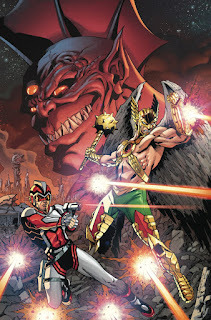 When I started this blog way back in hallowed antiquity, there was a tremendous amount of Hawkman comics out there for me the hunt down, and hunt I did, at various comic cons and sales. The upshot of this activity is that eventually you run out of books which you can find easily and cheaply, and with Hawkman, there is a definite schism there. So, with all of Hawkman volume 2, volume 3, and volume 4 in my possession, and all of volume 1 collected in Showcase Presents books, I have now began to widen my view to the Winged Wonder's non-headliner appearances, namely his runs in Detective Comics and World's Finest Comics. In the intermezzo between the end of his first title and his second, Hawkman (along with Hawkgirl) made some hay as a backup, first in Detective, but then for a longer term in World's Finest during it's oversized Dollar Comic era. (You can find more information on this era in the wonderful book The Hawkman Companion by Bearer Of The Honor Wings Doug Zawisza!) I had not pursued these books much in the past because, when compared to issues of Hawkman's own titles, these tend be a bit pricier, no doubt due to the presence of other, more popular characters. And as is typical of my approach to things, waiting until Batman V Superman: Dawn of Justice was released, there has been a lot more uptick in discussion and movement on these Batman/Superman books. World's Finest Comics #264 -- Have not had a chance to read this issue yet, but I like the cover to this one since it has the hutzpah to only show Batman from the back, as well as the slimy green monster. Kind of a murderer's row of DC characters here, not that I am complaining about getting Superman, Batman, Captain Marvel, Green Arrow, and Aquaman in addition to the Hawks. World's Finest Comics #277 -- This cover is pretty unusual, I do not really know what to think of the powder blue backgrounds behind the backup characters, but at the same time I do like the bullseye motif. The colors in the Superman and Batman image are evocative, but I can't help but thinking that this would be better served with a normal color scheme. Still, looks like a fun comic, especially as an oversized book.